At Boatshed, we don’t ‘sell boats,’ we help great people and great boats to find each other. Boatshed sells twice as fast, on average, than other brokerages, and it sells more than any others – we’re also become one of the largest brokerage in the world. Global reach, local presence: This ensures that both buyer and seller get first-rate support, wherever they may be. At Boatshed, we understood long ago that selling a boat is an emotional decision. But the traditional yacht sales process did not take the seller’s feelings into account. We re-engineered the process with both buyers and sellers in mind, using techniques learned from the disruptive digital transformation that is sweeping most other global industries. This is what Boatshed has achieved. We are entirely centred on the seller and the buyer, and all of our operations exist only to provide each with the most satisfying experience possible. We only charge a commission if we are successful; if not, our services are completely free. Research figures based on Boatshed.com International Yacht Brokers data recorded from 1999-2017. TYB - Tradiotional Yacht Broker a selection of independant Yacht Brokers, Sole Traders, Partnership offices in UK & Europe from 1999-2017. When you list your boat with Boatshed, you log in to the best technology in the industry. 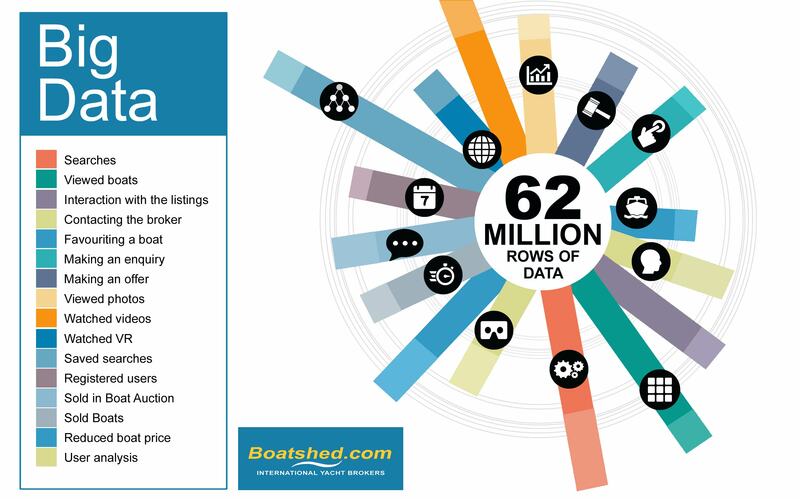 Boatshed has records of thousands of viewings, dating back to 1999, and these have resulted in literally millions of engagements with boats by customers. This includes all user activity on the site including searches and saved searches, the number of times boats are viewed, how many of the pictures and videos are viewed, interaction with the listings e.g. contacting the broker, 'favouriting' a boat, making an enquiry or an offer, etc.). We now have over 62 million rows of data, which we feed into a server ready for analysis. The analysis then takes this information and, using proprietary algorithms in what analysts call a “Recommendation Engine,” makes real-time predictions of customer behaviours. That may sound terribly technical, but the result is terrifically useful. First, we can make extremely accurate predictions on which boats a buyer will be interested in. We reinforce this knowledge with further analysis of customer actions – based on boat viewing patterns, we know that when a customer is interested in a certain boat, there are specific other boats that the customer is likely to want to see. The result is that we can then be very precise about which listings we show a potential buyers, zeroing in on those that are the most relevant, and providing all the information about those listings. value and a faster sale. This online platform reaches right across the globe. Today, it’s common for buyers from Japan or Saudi Arabia to find the boats they are looking for in Belgium or Barbados. The traditional yacht broker putting ads in local media or office windows is being overtaken by technology. We provide all the information, processes and support required to enable buyers and sellers to reach a decision. Our philosophy is of total transparency, and it means showing the boat with all its advantages and all it’s defects. This goes against all the traditional techniques of boat selling, and it’s again a reason why we sell faster and in greater numbers than other brokers. Transparency, showing a boat warts and all, actually increases the number of potential buyers, because the offer is credible. Our platform manages all aspects of the brokerage process, and so puts all relevant sales and process information at the fingertips of both buyer and seller. Boatshed brokers are entirely focused on the customer and boat, are always there to support every aspect of this process. Alongside our technology, our key attribute is that we are based where the boat is, local assistants and knowledge is a key ingredient. We are, to coin a phrase, High-Tech, but also High-Touch. Just as Boatshed has disrupted online boat selling with our technology, so we have an innovative approach to the human side of the sales process. Boatshed is not a traditional sales organisation. All the members of the team are there for their particular skill set, whether that be in technical development, accounting and finance, sales process or legal, or indeed marine and yacht expertise. Boatshed recognises that the sale and purchase of a boat is a process, quite difference from that of traditional selling. It’s more about creating a process, an environment that facilitates the sale and purchase of boats for our buyers and sellers, accomplishing the sale ultimately, but only with the minimum of stress for all parties involved. In certain areas our service is managed using Modular Brokerage. This means the sale of a boat is broken down into separate phases. As a seller, you will work with an agent locally, but you will also have a dedicated person managing the deal at our central headquarters. Agents initially are tasked with working at the local level: Finding listings, taking photographs, accompanying viewings and dealing with keys, etc. These locally based Boatshed agents are there to work closely with buyers and sellers on the ground where the boat is. handled by Boatshed HQ, including paperwork and contracts, insurance, with a dedicated broker to track the progress of the entire deal. Our centralised financial services manage the actual funds involved, providing the most efficiency for this part of the dealing. Thanks to our innovative breakdown of the selling process you’ve always got expertise at hand. Our attention to the personal side of a sale is such, that we ask no commitment from either buyer or seller, right down to the moment of final decision. Boatshed recognise that the purchase and sale of a boat is an emotional decision that may happen at any point during ownership or the potential purchase cycle. Does anyone really know the best time for them to buy or sell? This is why we say that: “Every boat is always for sale.” It’s just that the owners have not yet made the decision to sell yet. By continuously promoting many boats, we offer our sellers a chance to decide on a potential at any time. Why should they be restricted? If an offer comes up that you really like, then take it. If not, just keep on sailing! This approach enables a broad international range of potential buyers to be assembled, as well as a vast selection of boats for them to choose from. This ‘always on’ approach also allows far greater flexibility to buyer and seller. When it’s right on both sides, Boatshed will conduct the transaction, but only if it’s right. Boatshed recognise that the purchase and sale of a boat is an emotional decision that may happen at any point during ownership or the potential purchase cycle. Does anyone really know the best time for them to buy or sell? This is why we say that: “Every boat is always for sale.” It’s just that the owners have not yet made the decision to sell yet. By continuously promoting many boats, we offer our sellers a chance to decide on a potential at any time. Why should they be restricted? If an offer comes up that you really like, then take it. If not, just keep on sailing! Boatshed’s international range of buyers and sellers makes it much more efficient than other brokerages. We’ve got a local presence in all the major markets, and it’s backed up by an international corporate organisation. We speak your language. If you are selling a boat in the UK to a potential purchaser in Croatia, or if you are buying a boat in Greece from a client in France, it is important that specifications be understood, that translation be managed and that customer care is available in the local languages. Similarly, the legal and financial elements of the deal must be translated and understood by both parties. Boatshed, having grown up as a business based in numerous international locations, has developed both technical and customer-facing systems to deal with different tongues, including technical marine translation in 12 languages. We can provide practical help in local language, and with knowledge of local laws and regulations, as well as yacht trade practice. We also provide local understanding: Our people on the ground share your customs and will work with you accordingly. We are a full service brokerage organisation, and we manage not just the listing, but also all of the elements of the transaction, including secure handling of client funds, contracts, transfer of ownership, as well as dealing with all of the logistics, cleaning, servicing, delivery, etc. Boatshed can securely manage funds in international sales thanks to its secure, central financing operation. Our finance team has over 60 years of experience in international finance and can assure security and compliance at the highest level. Our modular brokerage approach combines proximity and expertise. Having a person on the ground near the boat for sale is a critical part of the sales process. Buying and selling a boat can often be a logistical nightmare, so there is no substitute for local support, someone to deliver keys, to help with access to the boat, to manage physical viewings and to sort out the hundreds of local challenges in the sale of a boat. And we at Boatshed are there on the spot for you all the way through the process until the boat is delivered to its new owner. We don’t just think global; we are global. But we are also there for you locally. Many people have had bad experiences with yacht brokerages. This has given the business a poor reputation. Boatshed provides a different experience: Customer-focused, transparent, efficient. We have innovated with comprehensive knowledge of the industry. We have analysed and transformed the process of boat selling – we defy anyone to propose a better way to sell boats. That is because we do not ‘sell boats;’ we bring well-matched buyers and sellers together.